A blessing of dorm rooms? What’s that about? Well, Christians have been giving thanks and having things blessed for a long, long time. Voyages. Harvests. Marriages. Pets. Building sites, you name it. So, why not bless the place where you live, study, and relate to roommates? Last year, the Saint Benedict Forum organized the first-ever blessing of dorm rooms on the campus of Hope College. The event was such a hit that it was brought back again this year. This year’s blessing of dorm rooms took place during the second week of school once students had time to settle in . . . and to give them an excuse to do some possibly needed housekeeping. Like last year, Fr. 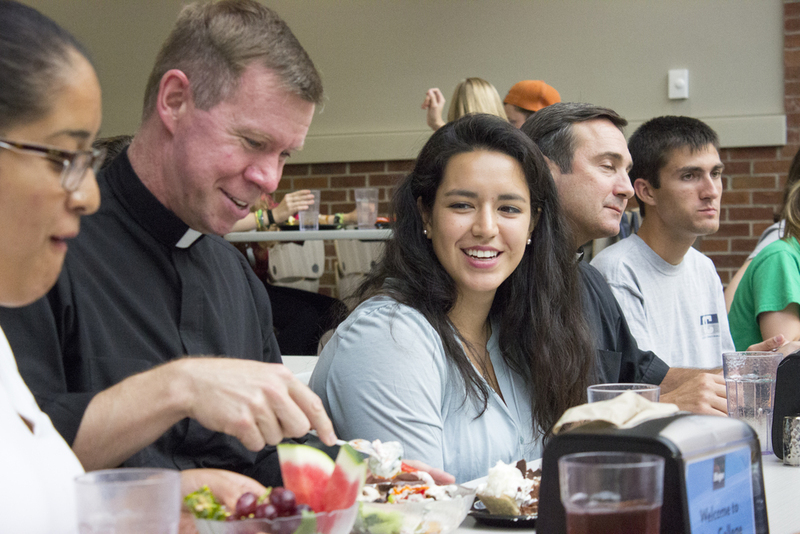 Charlie Brown of St. Francis de Sales Catholic Church in Holland, MI, met a group of excited students at Phelps Dining Hall to share a meal with them. Joining him this year was a new face, Fr. Bill VanderWerff. Fr. Bill, a recently ordained priest, replaced Fr. James VanderLaan earlier this summer as Associate Pastor at St. Francis de Sales. This meal provided the Fathers a chance to catch up with some students after the long summer break as well as to form new friendships with others. Once the conversation came to an end, it was time to begin the blessings. One student led Fr. 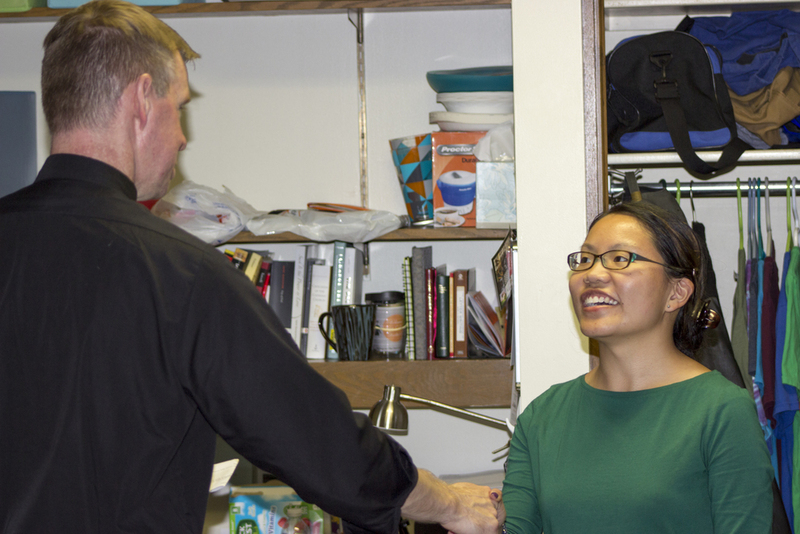 Bill to most of the dorm rooms slated for a blessing while another student guided Fr. Charlie to the remaining dorms as well as the cottages and apartments. Credit should be given to the students, especially the freshmen, who signed up for this event. I am sure it took a good deal of courage for them. It can be unnerving to consider having your new friends see a priest standing in your room performing what looks to them to be a strange ritual. First, the priest begins in prayer. Then he reads a passage of Scripture. He douses the student, room, and roommate with holy water to recall one’s baptism. Finally, a communal Our Father is offered along with a blessing. And, there you have it—the old dorm room has passed away; behold, the new room has come. Or, something like that. As Fr. Charlie finished blessing a dorm room, a freshman asked him to bless her room. She had seen the announcements but had not signed up. The ability to bring peace of mind to a new student who is still adjusting to Hope highlights the importance of the bridge that the Saint Benedict Forum provides between Hope students and St. Francis de Sales Catholic Church. By inviting Fr. Charlie and Fr. Bill into their rooms, students were able to interact with them in a more personal way than they are used to doing at Mass. As a new school year is underway, and prior to first exams, this could hardly have come at a better time. Thank you to Fr. Charlie, Fr. Bill, and to all who were involved. “The Saint Benedict Forum and St. Francis de Sales Catholic Church, blessing rooms since 2014.” Now that has a ring of a nice tradition to it . . .
All photos were taken by Aaron G. Estelle.